Stand with your feet together and legs slightly bent. Place your hands at the Lower Dantian. the left hand over the right hand. Your back should be straight and arms loose. Step to the right side with the right foot and at the same time move the right arm out to the side of the body. Your right palm faces forwards and your left arm should stay by your side. Continue to move the right arm upwards to the Sky Eye (see page 66). As your your right hand comes to the Sky Eye, start to shift the weight to the right side and lift up the left hand to the side of the body. 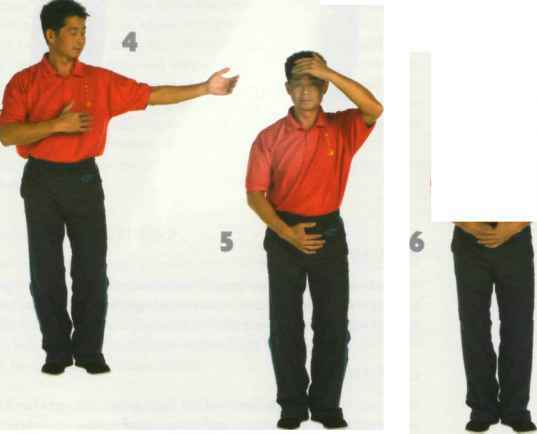 4 Simultaneously close your left foot next to the right foot and start to lower your right hand to the Lower Dantian and raise the left hand up to the Sky Eye. 5 Bring the left hand up to the Sky Eye and the right hand down to the Lower Dantian. Make sure to follow the Ren Channel as you lower the hand. 6 Repeat the same walking walking right foot/right hand, left foot/left hand for a total of six steps on each foot. Make sure that when one hand is at the Sky Eye, the other hand is at the Lower Dantian and feet are together. The hands should be balanced and move together. 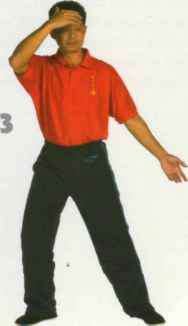 When you come to the last step, closing the left foot to the right foot, let both hands come back to the Dantian. 7 Start to walk back to the left, taking the same number of steps that you walked initially. 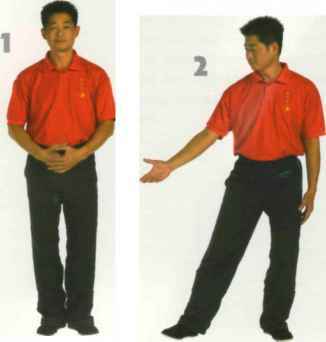 You should first step with the left foot and lift up the left hand together. 8 Keep repeating the same exercise and walk back to the original starting place. Throughout the whole movement, breathe naturally. You do not need to connect with the left hand to breathe in or right hand to breathe out as this is a sequence of movements. Make sure you move left hand and left leg together and right hand and right leg together. Throughout, make sure you keep your knees bent and the body at the same level. Do not move up and down as you step. Keep the eyes on the hand that is lifting. A lot of the time when we walk, we rush. If we walk too fast, we will use energy. In this exercise, you should walk slowly, so the Qi will go through all the channels slowly and cover every part of the body. That will help your mind and body to connect together because you are moving slowly. As you bend your knees to walk, all your weight is on your thighs and your upper body will feel light. This will create a warm feeling in the body as the Qi is building up in the bones and marrow of the legs. Sometimes, however, your legs may be a little bit tired because you are keeping the knees bent the entire time, but this is a very good way to develop Qi and make the whole body strong and healthy. At you move the arms, you are collecting energy. You should make sure that your palm faces and lowers down the Ren Channel (see page 64) and all the way down to the Lower Dantian. This way, every time you move, the energy will go down to the Lower Dantian and open the Ren Channel. This will benefit your circulation and help your liver because the liver is involved in blood circulation. As you do the movement, make sure that you coordinate your hands and step. This movement obviously comes from Green Sea Swimming Dragon Gong (a form in the Kunlun Dayan Qigong system), but the footwork is slightly different. When we do this movement, we keep collecting the Qi to the Lower Dantian with simple walking. In Healthy Living Gong, we have both stationary movements and walking movements, and these act like Yin and Yang to balance our Qi. EVERYTHING IN THE universe follows the law of movement and stillness. As human beings, we move and we also rest. Nature has its own times of movement and stillness, growing and resting. These are the seasons, like spring and winter. The Yin and Yang principle determines all. In Qigong, movements such as we learned in Chapter 11 are followed by meditation so that we can store the Qi that we have gathered. Meditation is a state of consciousness, and unconsciousness, it is a way of relaxing, making the body quiet and letting everything go back to normal, without movement. The Chinese call meditation Jing Gong, which means Quiet Gong. It is good for gathering and settling down Qi and bringing Qi back to normal. That is the power of nature. Qigong movement helps us open up the channels and acupuncture points, relax the muscles and loosen the joints and release negative energy. It is like shaking dust from our clothing, although the dust comes out of the body, not our clothing. Meditation, however, allows the fresh Qi that we have gathered from our practise to settle down in the body and stay in our heart, lungs, kidneys and other internal organs. This is important, as the internal organs will then have a healthy supply of Qi that can be used when we are tired or ill. If we do not meditate after practising Qigong, the Qi we have gathered will not be stored. This would be like putting money into a pocket that has a hole in it. If we practise meditation only, without doing movement first, it takes longer to stimulate the Qi in the body and to let any physical problems get better. Our joints and muscles will not be strong and we will not be able to rid our body of all the negative energy. Therefore, we should practise movement first before we do meditation. This is the best way. When we are ill, if we only do meditation it will take much longer for the body to recover. This is because in the beginning, illness begins on an external level. You have a feeling that something is not quite right, like just before catching a cold or flu. Within a week, if we do not get rid of the sick Qi, it will go to our internal organs. If we still let the sick Qi stay there, it will eventually go to the bones and this is very difficult to get rid of. When we move, negative energy can be released much quicker. I have a Qigong student who has suffered from the auto-immune disease lupus for the last seven years. He was doing fine until he stopped practising his Qigong, and then he had a relapse which affected his kidneys to such a point that he went into hospital in a critical condition for three weeks, having to have daily kidney dialysis. He said that he lost confidence and took bottles and bottles of every kind of medicine available, both conventional and alternative. He also tried different kinds of therapies and healings but none worked. He contacted me to help him when 1 was doing a seminar near where he lived. After three treatments, he already felt his energy improve to a point where he could go back to his Qigong exercises and standing meditation (Ma Bo). He said that after building up to standing Qigong for twenty minutes a day, he had much more energy and was able to recover by himself. He asked me why the Qigong had not worked before and I explained to him that he had gone in too many directions, trying too many different things. Instead of trusting his Qigong, he tried too many different things. You need to trust and develop one thing to have success. Michael Tse practising the Ma Bo (Horse Stance Meditation) in China. and because of this it is can be used as a Qigong movement as well as meditation. 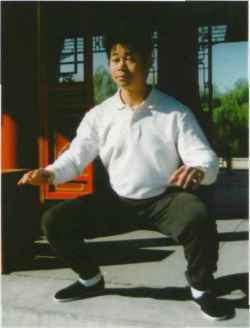 When I have any illness or injury, I do Horse Stance (Ma Bo) to help bring up the strong Qi to help the body to recover. 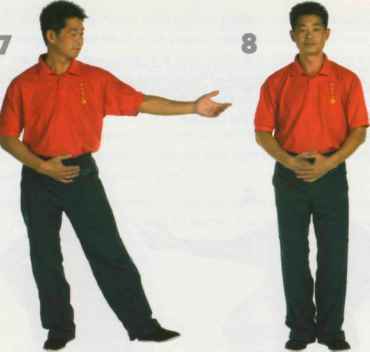 I also get all of my patients and students to practise this method, as it will make the Qi very strong and make their other Qigong forms good. In another case, one of my students had a shoulder problem and so I recommended he do the Healthy Living Gong movements Separating the Fog to Look for the Clouds and Golden Dragon Stretches Its Claws to help loosen the joints, and then to do sitting meditation. 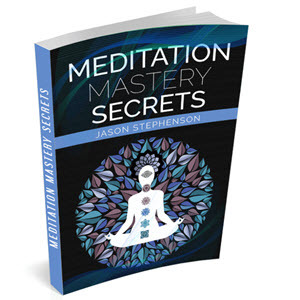 So every day, after his practice, he would do sitting meditation and found that it helped. This is a Yin type of meditation and can be used in combination with Yang type meditation practise. Some people only practise meditation without doing any training of movement. Therefore, they are not strong, although their spirit may be high and the mind calmer. When these people only do meditation, they will have poor circulation and bad posture, particularly in the neck area. This is like having only one season, a winter without the summer. For the body to be balanced, you need both seasons. Actually, we should cover both Yang and Yin, which is both movement and meditation. Movement is like hot summer and meditation is like a cool wind. This is a wonderful balance between Yin and Yang. How to balance the qi through qi healing? Can you have qi from walking? Does qigong heal cold and flu? Which hand on the dantian? How to build the lower dantian? How to balance lower danttian? What are the twenty acupunture points in dayan qigong 64 steps?